The information on this website is not intended to diagnose, treat, or cure any disease. This website does not offer a cure from the outside. Instead, it arms you with the knowledge to bring the core systems of your body back into balance so that you can cure yourself. This information is not a substitute for quality health care provided by a licensed and knowledgeable health care practitioner. In fact, Michelle Corey encourages you to review the material on this website your physician. 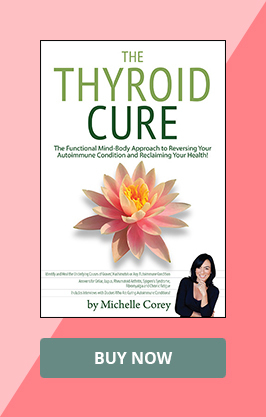 Michelle Corey and Vibrant Way are not engaged in rendering medical, psychological or any other kind of personal or professional advice on this website. Michelle Corey and Vibrant Way specifically disclaim all responsibility for any injury, damage or loss that the reader may incur as a consequence of following the guidelines detailed on this website. Before making any decisions based upon the information and recommendations found here, you should first check with your own physician. This website is designed to educate the reader in a “new way of thinking” about why we’re getting sick and how we can heal. Research about this subject is ongoing and subject to conflicting interpretations. While every effort has been made to provide accurate information, Michelle Corey and Vibrant Way cannot be held responsible for any errors or omissions.